For almost two decades, the government’s liberal policy on the fuel and energy sector has been the subject of debate and protest. The recent public outcry against the fast and steep rise of fuel prices has again put the country’s deregulated oil industry on the stage. In March last year, Baguio City Representative Mark Go asked the House Committee on Energy to investigate oil companies for the outrageous price disparity, especially between Baguio City and La Union towns, and possible overpricing. Congressional inquiries on the industry are not new, so are the efforts of oil companies and their cohorts in both Houses to block any move to reverse deregulation. Lawmakers started conducting hearings “in aid of legislation” just a few years after Republic Act 8479 or Downstream Oil Industry Deregulation Act of 1998 (RA 8479/Oil Deregulation Law) was implemented. The most recent before this administration is the House inquiry in August 2011 that stemmed from Resolution 1170 filed by former Bayan Muna Rep. Neri Colmenares to determine the cause of “unusually high prices of fuel products imposed by oil companies” in Negros Occidental, the cities of Cebu and Davao, as well as other cities and provinces outside Metro Manila. 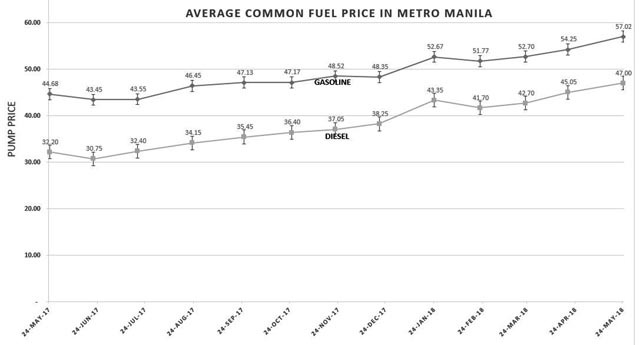 With the implementation of the Tax Reform Acceleration for Inclusion Law (TRAIN) adding to the Value Added Tax on oil and oil products passed under Gloria Arroyo, the dangers and public burden of unchecked pump prices became more apparent. The dialogue between oil retailers and the City Government of Baguio last Thursday, June 14 gave additional proof of the super profit raked in by industry players and the tax burden that the militant mass movement had pointed out for a long time. These incidents of clear overpricing, growing public discontent and urgings by progressives in the Lower Chamber have forced both Houses to undertake a more serious look for a possible amendment of the Oil Deregulation Law. To understand why laws and policies governing the oil industry continue to fall short of the government’s mandate to ensure fair price for the public, a short probe of the country’s handling of the petroleum business is necessary. The petroleum business passed from its deregulated character, before the oil crisis in the 70s, to a regulated state with the passage of the Oil industry Commission Act in April 1971. The Marcos dictatorship undertook different steps to intervene and regulate the industry. In 1973, the Ferdinand Marcos, Sr. established the Philippine National Oil Company (PNOC) under Presidential Decree (PD) No. 334 and the Oil Price Stabilization Fund (OPSF) by virtue of PD 1956 in 1984. However, both failed to hamper oil price hike or produce reasonable pump prices. The dictatorship’s cronyism and corruption resulted to intense social crises dragging the peso down and prices of basic commodities sky-high. Furthermore, undertaking the country’s petrol business was more of ensuring Marcos’ personal interests, than serving the public’s benefit. Exemption provision in the decree that created PNOC and the president’s sole control over the fund allowed Geronimo Velasco, the head of the PNOC, and Marcos to do away with normal auditing procedures. The Commission on Audit during Cory Aquino’s time said they believe the dictatorship siphoned huge funds from the company and the OPSF but “don’t know how much it was” since it was never audited. In his statement on the signing of the law, Ramos emphasized two things — that liberal economic policies intend to “make the private sector the main engine for national growth” and “the interest of the consuming public is the primordial concern” of the new law. In its Memorandum of Economic and Financial Policies dated March 11, 1998, submitted to the IMF, the government of the Philippines identified the policy undertaking as the “key plank of our structural reform agenda.” The document outlines the policies the country plans to undertake in relation to financial support from the funding agency.